It felt like looking into the future of flash storage. The most awe-inspiring highlight from the 2014 Flash Memory Summit came when Western Digital’s HGST division demoed an ultra-fast solid-state drive prototype and clocked it in at mind-boggling three million IOPS. For comparison, the fastest server solid state drives (SSDs) on the market are capable of reaching only 500,000 IOPS. Using phase-change memory (PCM) architecture and specially-modified PCIe® 2.0 interfaces to handle the workload, the prototype reached ultra-low latency (around 1.5 microseconds) on short transfers—an access time 35 times faster than the fastest SSDs. Several companies in the storage and memory industry have made the push find a new memory standard to replace NAND flash memory using PCM technology. HGST’s prototype does this by way of tweaking the architecture of the bus protocol, essentially making the non-volatile memory express leaner and more efficient, requiring fewer round-trip operations per I/O. HGST calls its architecture DC Express (DCe) and the company will surely be quick to demonstrate its 10-fold IOPS performance boosts and dramatic read latency reductions at future tradeshows and on YouTube. The impressive speeds make for an interesting PR angle, but a couple of factors might keep this technology off the market—at least in the short term. One potential stumbling block is that HGST’s proprietary DCe interface may take time to gain traction across the industry. Adoption of DCe will likely come down to the performance advantage that PCM drives have in terms of read latency, hence the coming-out party of sorts HGST staged at the Flash Memory Summit. If DCe catches on, it could mean huge returns for HGST. Surely, watching this all unfold over the course of the next year should be the big story in the solid state drive (SSD) space in 2015. Having recently invested one billion dollars in Flash research and development, IBM is hoping to make an immediate splash in the SSD market by rolling out an improved model of its all-flash array, the FlashSystem V840 Enterprise Performance Solution. IBM positions this product as a compact, money-saving solution. It features the robust capacity and low latency typically found in an enterprise storage array, but without the server sprawl and licensing costs that come with a data center. Gartner classifies this type of devices as a solid state array (SSA)—which it differentiates from SSD systems in that they cannot use traditional hard disk drives—a market segment which IBM took over as the leader in 2013 on the strength of its acquisition of Texas Memory Systems the year before. Clearly this investment in SSA has borne fruit for the company. The V840 model features a single 2U rack unit, essentially combining the two 1U rack units that were featured on the previous model. The battery is integrated inside the rack unit as well. IBM bumped up the number of processing cores from six up to 16 (32 total since it is dual-controlled), and increased the cache from 64 MB to 128 GB. 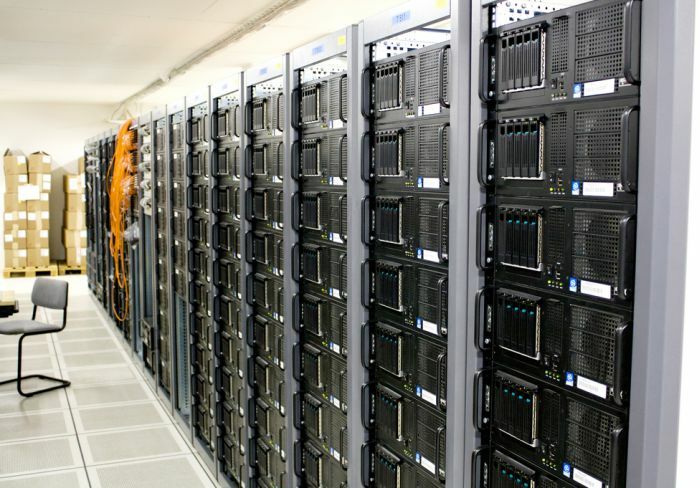 The company claims that the new V840 clocks in at up to 2.5 million IOPS. IBM Fellow Andrew Walls, distinguished engineer, CTO and chief architect of the company’s flash systems, says the V840’s performance improves by at least 33 percent over the last model. Already on the market, the newer V840 integrates the FlashSystem with IBM’s SAN Volume Controller (SVC) software stack in a new control enclosure, which Walls said is 36 percent more power efficient than the prior model. Perhaps the main selling point of the V840 is that it migrates data to the most appropriate storage tier—whether that is flash, disk, or tape—automatically. Additionally, flash capacity can be scaled up to support multiple applications; the virtualized system can be expanded (scaled out) to support higher IOPS and bandwidth; or the solution can be simultaneously scaled up and out to improve capacity, IOPS, and bandwidth while maintaining low latency. Two companies rolled out fast-performing PCIe devices. Primarily designed for server-side deployment, the Z-Drive 4500 from OCZ is a full-featured flash solution that integrates robust performance, reliability, data protection, and monitoring functions for critical enterprise applications and demanding big data environments. Z-Drive 4500 PCIe SSD Series provides an alternative to SAS/SATA cabling as a single drive that fits directly into a server’s PCIe bus. The Z-Drive 4500 is geared to meet the demandsfor driving Big Data applications. It leverages 19 nanometer MLC NAND flash supporting 800 GB, 1.6 TB and 3.2 TB usable capacities. OCZ’s proprietary Virtualized Controller Architecture™ (VCA) reorders storage commands and processes them across eight available controllers that act as one single drive to the host system. With eight controllers working in unison, the storage system delivers advanced RAID-like performance within a seamless, easy-to-deploy solution. HGST unveiled its new third-generation family of PCIe, the FlashMAX III, vaunting souped-up IOPScapabilities (clocking in at 540K) through a half-height, half-length PCle flash card. The architecture is designed for integrating different kinds of flash media, hardware and software. It is best suited for performance-intensive applications such as databases, SQL servers, data warehouses, video post-production applications, and big data deployment. HGST positions FlashMAX III as a solution that offers new levels of speed and capacity over its prior generation. Its 1,100 GB capacity is doubled from the II-series. It clocks in at 540K IOPs (up from 174K), and has a 2,700 Mbps read throughput that is up from 1,600 Mbps. It also and shaves a microsecond from its latency count, dropping down to 20 microseconds. Photo by Torkild Retvedt, taken from Flickr Creative Commons.